DALLAS, TX - At the end Heritage Auction Galleries’ Central States Numismatic Society Convention Platinum Night Auction on Thursday, April 30, the Adams-Carter specimen of the Class III AU 58 PCGS 1804 silver dollar lived up to its billing as “The King of Coins” when Bedminister, NJ collector John Albanese topped all others with a $2.3 million bid, including the 15% Buyer’s Premium. The total for the Heritage CSNS Auctions is currently at approximately $45 million with post-auction buys continuing at www.HA.com. The Class III 1804 $1 received widespread coverage in the mainstream media in the days leading up to the auction, and the buzz in auction gallery was equal to the advance publicity. As coin collectors and curious onlookers alike watched the auction live in Cincinnati and on HERITAGE Live, the company’s real-time proprietary online bidding platform, there was a collective hush as the coin climbed past $2,000,000 and spontaneous applause when this most famous of coins finally found its new owner. While the Adams-Carter 1804 $1 grabbed the headlines, the overall success of both the rare coins and the rare currency auctions is the hidden story in the whole night. 1870-S Seated Dollar, XF40 PCGS , Ex: Ostheimer The legendary rarest regular issue silver dollar ever coined at any United States Mint. From the Alfred and Jackie Ostheimer Collections. Realized: $503,125. Sixth Finest Known 1794 Dollar, B-1, BB-1, MS61 NGC, Ex: Murdoch, Bass Specimen Only a small number of 1794 dollars are known today with strong definition on the left portion of each side and this is such a coin. Listed as Specimen Number 6 on the Condition Census as compiled by Martin Logies in The Flowing Hair Silver Dollars of 1794. Realized: $503,125. 1876-CC Twenty Cent Piece, a celebrated foundational rarity, MS66 PCGS, tied for finest certified The 1875 introduction of the twenty cent denomination was a direct outgrowth of the increasing power of Western silver-mining interests and the “Crime of ‘73,” the Mint Act of 1873 that among other things demonetized the silver dollar and eliminated the half dime. The total surviving population is estimated at 16 to 18 pieces. Realized: $460,000. 1794 B-1, BB-1 Silver Dollar, AU55 NGC, Continuous Provenance Dating to 1864 The McCoy Collection Specimen, with a continuous provenance dating back to 1864, this piece is one of the most historic 1794 silver dollars among the 135 or so pieces currently known, of which this coin is considered the 10th finest. Realized: 345,000. 1795 Flowing Hair Dollar, MS65 NGC, B-1, BB-21 One of the finest known of this date and type and a remarkable coin that any numismatist will appreciate for the lustrous fields and exceptional surfaces. 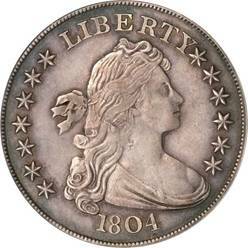 There are no disturbing adjustment marks or nicks worthy of note, and it is simply amazing that any Flowing Hair silver dollar could still look this nice after 214 years. Realized: $276,000. 1795 B-15, BB-52 Dollar, MS65 PCGS From the Cardinal Collection. There are two varieties known for the 1795 Draped Bust silver dollars, known as the Off-Center Bust (B-14) and the Centered Bust (B-15). Most numismatists believe that the B-14 dollar was struck first, followed by the B-15, which is what this example is. A masterpiece of the coiner’s art. Realized: $253,000. 1918⁄7-D Buffalo Nickel, MS65 PCGS tied for Finest Certified, Historic Overdate A diligent search of auction records reveals just four appearances of this issue in Gem condition during the past 15 years. Heritage was privileged to handle the coins in two of these appearances, one in the Central States Signature Sale (April 2002) and another in our Exclusively Internet Auction Sale (May 2001). The high technical grade, intense aesthetic appeal, and fascinating history of this coin combine to make this offering one of the most desirable examples of 20th century coinage. Realized: $253,000. For more information on prices realized in this auction, to read detailed lot descriptions and download full-color hi-resolution images, go online to www.HA.com/CSNS.